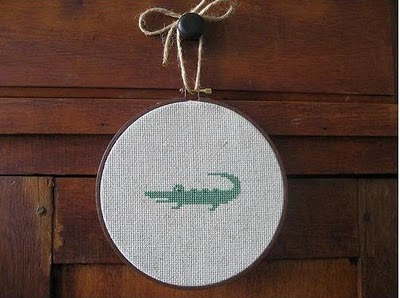 I first came across Andwabisabi's charming designs in the Flickr pool; with this cute alligator / crocodile stitched by Sarachung. 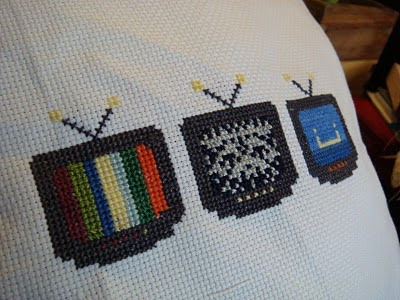 So, I just had to get some cross stitch action for myself and amongst the patterns I bought, was this lovely TV design, perfect for making up into a cushion for the sofa, where we, well, spend all our time watching TV. Andwabisabi carries an astonishing array of different, colourful cross stitch patterns, ranging from the simpler to the more time consuming. I have the .pdf of her large Dream City pattern waiting, ready to go. Definitely a shop I will keep checking back with. My daughter in law just started to cross stitch. I'm going to add a link to Dream City for some encouragement & inspiration. Thanks! The TVs made me giggle! how cute.